I’m getting ready to travel to the Netherlands and Belgium in about a month’s time. There is actually a fair amount to do, check and get beforehand. Because I’m traveling alone, there are a few other considerations to take into account. When I traveled to Ireland a few years back I went with my sister. We rented a car, drove as far as we could each day and then as the sun was dipping below the horizon we’d drive into the nearest town, have a drink at a pub and ask them to recommend a B&B. It worked well 90% of the time. We were off season (the end of Sept.) and the towns we stayed in were not the larger cities. That’s why in Kilkenny, a college town, it almost didn’t work. It was a Saturday night and full of party people. It took three tries but we did find a B&B. So I thought I could do the same thing as I traveled to the Netherlands. I land in London first and as I always do I like to book my first and last nights so that I know that I’m set. I find that Trip Advisor though you have to look at more than a few reviews to get a sense of place. But I will then search elsewhere for rooms, hotels, B&Bs or hostels and check their own sites as well. As I did the preliminary research for Amsterdam I was a bit shocked at the price of any lodging. A quick look into Belgium showed it to be much the same. My sister and I got a B&B for an average of 25-50 Euros, which equaled between $$35-$60 CAD. Traveling with someone can definitely cut the rate down but here I was looking at hostels, sharing for 50 Euros a night. Yes, there are cheaper places but it’s a fine line to find something that is cheap enough, fits your needs and is clean and pleasant enough. The reviews fit one or the other criteria, but not both. So I started looking farther afield, googling things like B&Bs Amsterdam, and cheap lodging Amsterdam. This turned up a few more sites. Bed and Breakfast Netherlands lists a lot of actual homes used as B&Bs that you might not find on Trip Advisor. It also breaks the cost down to a single person price. I haven’t yet tried it though. Couch Surfing can also work and I’ll be trying it for the first time though I’ve already hosted a few people. You don’t have to reciprocate in hosting but it helps for references. I’m looking forward to meeting some of the people who live in these cities. It’s the best way to know a culture. 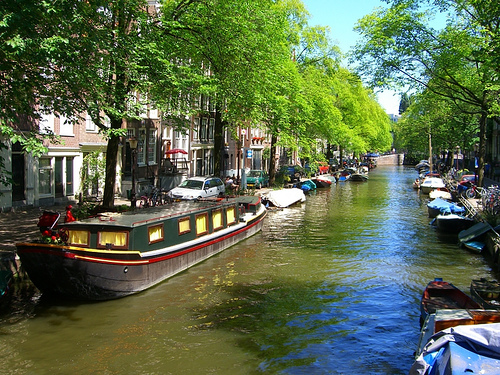 Note that during the high months, Amsterdam hosts can get as many as 10-20 requests a day. It’s one of Europe‘s hotspots and a mecca for the gay crowd. I didn’t realize all this and even though I’m going at the end of Sept. I’m glad I started early. I’ve spent quite a few hours (probably 24-30) just searching out possible accommodations for Amsterdam. I’m not going to book every night everywhere because I don’t know where I’ll go but I now have an idea of what it could possibly cost me (my whole budget). My stay in London is coming in at $120 for two nights at a B&B and that’s a good price. Know that many Dutch homes are narrow and tall, with very steep stairs. it’s part of their history where land was eked out from the sea so up was the way to go. Amsterdam is of course more expensive than some of the other towns and there are such designations in some of the travel guides as “stoner hotels.” Yes, smoking pot is allowed in some if not all establishments. Again, money is interesting and it’s looking like traveler’s checks are becoming too outmoded, and that most places won’t take them or will charge an exorbitant fee for cashing them. As well, many Dutch hotels or B&Bs only accept cash because credit card charges eat up their profits so they just don’t use them. Once I’m on the road, I’m sure my experiences will differ some and I’ll report on that. But the best advice for traveling to Europe is check ahead of time on the type of lodging you want and whether you can afford it. I’m glad I did and I’ll be using several options.